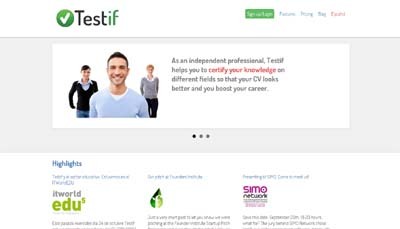 Testif is a Web application which easily allows you to create interactive tests (typically multiple choice, but more than 10 question types are available), so that you can test your or somebody else knowledge. Testif is also known as a Computer Based Assessment software (CBA), but we want to be funnier than that, and for this reason we have introduced many gamification concepts, such as rankings, badges, etc. It’s funnier, and it’s supported by an open source application named Ostests, so we don’t lead clients to the vendor lock-in phenomenon.